Wong Goe Yok Photo, 1897, Chinese Exclusion Act case files, RG 85, National Archives-Seattle, Wong Goe Yok file, Box 1155, Case 11608/3-2. The State of Nevada did not require birth certificates until 1911 so when Wong Goe Yok’s parents took him back to China in 1897, they obtained an affidavit by witnesses swearing that he was born about 1895 in American Canyon, Humboldt County, Nevada. His mother was Chun Lun and his father was Wong Ying. The affidavit was signed by John T. Reid, clerk; L. M. Donelin, Agent S. P. Co.; A. C. Brown, rancher; S. R Young, Notary Public; and George Young, Justice of the Peace. 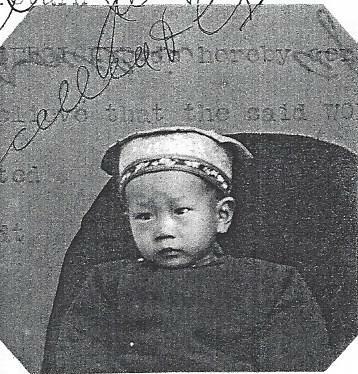 Although Humboldt County started requiring birth certificate in 1887, Wong Goe Yok’s birth was not recorded. The affidavit was accepted as proof when Wong Goe Yok applied for admission to the United States as a native-born citizen on 11 July 1921.